1. Change the environment to potentially stimulate an improved response. Think not so much about the actual environment of the gym, but more about the type of environment you are exposing the athletes nervous system to. Change the internal / external environment to change proprioception, kineasthetic awareness in line with the training task. The primary idea of this strategy is to encourage your athletes to self-correct and therefore speed up the learning process. A simple example can be seen below. Picture 1. 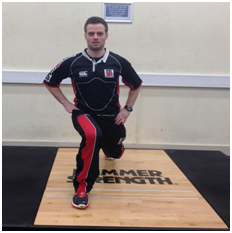 Normal environment, the athlete is struggling to maintain appropriate knee alignment and drifting in the frontal plane. Picture 2. Stimulated environmental change. 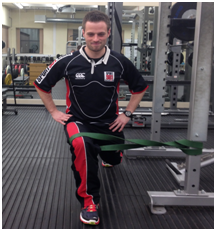 By stimulating an increased pull in the frontal plane (use of a theraband) this allows the athlete to engage the appropriate tissue and maintain an ideal knee position. give it a try !!!!! !